We've seen the results of a face-off between the Samsung Rugby and Motorola Tundra, but what happens when the Rugby has to face one of its own? In today's review we discuss a face-off between the Samsung Rugby, hailing from the AT&T corner, against its cousin, the Samsung Convoy, hailing from the Verizon corner. Samsung Convoy vs Rugby – let the fight begin. Both phones claim to be rugged, military spec phones, coming in at a similar price tag and with a similar design, but from two separate carriers. Which is the better phone to buy, is the question being asked here today. So put on your war paint and camouflage as we take a hard look at both of Samsung's tough phones, as they compete against each other. Samsung Rugby: The Rugby comes with a very standard flip based design, it's a heavy and thick phone as it weighs about 132 g and has dimensions of 100 x 52 x 23 mm, so it's not a dainty dancer, that's for sure. The build quality is very rugged, there is no rubber or metal anywhere, just some ridiculously strong plastic. The front has a 1 inch external screen that displays various information such as time, date, missed calls, signal, strength etc. Unfortunately you cannot use the external display as a viewfinder, or as a self portrait shooter, and there is no dedicated button to turn on the phone's back lighting once it has gone off. You have to raise the flip slightly to get the back lighting back on again. Flipping open the phone reveals a 2.2 inch QVGA screen with a native resolution of 176 x 220 pixels that is capable of supporting 262,000 colors. The rest is a simple affair, other than that huge loudspeaker grill and small 1.3 MP camera, the phone sports a standard navigational pad when flipped open and a comfortably back lit dialing pad. The only buttons of note here are the quick web access button and dedicated Web TV button. The left spine includes the volume rocker and PTT button, while the right side houses the loudspeaker button and combined charger/headset port, and to make it worse, it's a proprietary port, so if you lose either the charger or earphones you'll be in a lot of trouble. What's even worse is that you can only use one peripheral at a time. Samsung Convoy: The Convoy looks much better right off the bat, they look like identical twins in terms of designs, but the Convoy is the twin that took a bath and put on its best suit to the party. It weighs 110 g, and with dimensions of 98 x 51 x 24 mm it's the more palm friendly phone. The front screen is brighter, looks bigger (it's not though) and can be used as a viewfinder and self portrait camera. Also the dedicated music playback buttons don't hurt either, and the ever present loud speaker is actually a dual speaker, even if it just looks like a single speaker. Even the centrally placed camera is a 2 MP snapper, a marked improvement over the Rugby. Flipping open the phone reveals a 2.2 QVGA inch screen with the same resolution and color support as the Rugby, but it does look brighter. It does have an almost identical navigational pad, and a truly identical dialing pad. The only difference is the Web access button is replaced with the camera shortcut and the Web TV button by a dedicated voice dialing button. The left side houses the volume rocker, PTT button which can be assigned a new function and the proprietary charger port, which is as welcome as a giant wasp on an open injury. The right side houses the wasp's other relation, a 2.5 mm jack, what's the point of having a musically capable phone with a 2.5 mm jack? Then further along the right spine we find the microSD card slot (kudos!) and speaker phone button. At the back we have an identical screw based locking mechanism like the one on the Rugby, though it is extremely flimsy. Samsung Rugby: The user interface flows smoothly and without any stutter. You have a selection of games to play such as — Ms.Pacman, Pool 3D and Tetris. You also have access to AT&T's video, music, TV and Webcast streaming services. Though the amount of buffer time and pixilation makes watching videos on the Rugby an almost pointless endeavor. 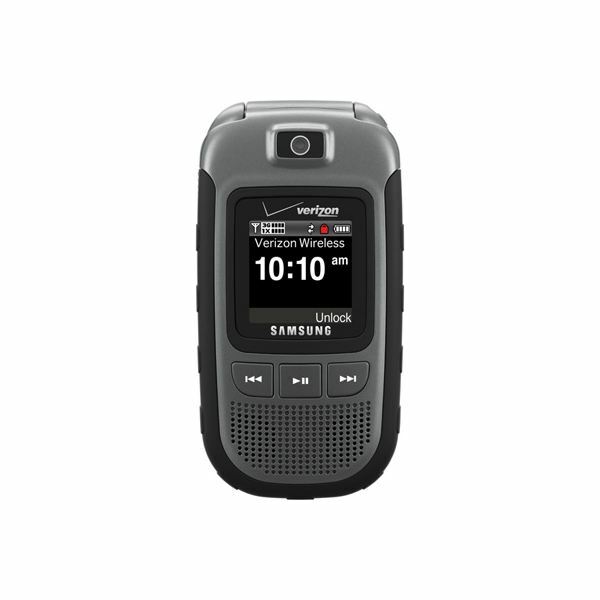 The Samsung Rugby comes with no voice dialing capabilities, but you do have the option to use AT&T's Video share service, and you can also make use of AT&T's Navigation service, voice navigation and everything included. The phone book can store a maximum of 1,250 contacts, with multiple field entry supporting six fields per contact. You can assign groups, tags and even ringtones. Messaging is adequately handled with SMS, AMS, MMS, email and IM, though you'll need to download a free JAVA chat client first. Email supports only the POP3 protocol, no IMAP4 here. Samsung Convoy: The Samsung Convoy has three options for changing the main menu, grid, tab and list. You can also choose from preset colorings and download new themes and wallpaper from Verizon's store. You can even replace the traditional menu application with your own favorites, so the main menu is pretty functional. You also get a host of Verizon apps, such as Vcast and Vstream. The screen resolution of 176 x 220 does not do videos any justice, so don't buy this phone thinking it's going to be a video streaming hub. The phone book supports a maximum of 1,000 contacts, and multiple field entry is limited to five fields per contact, and you can assign over twenty polyphonic ringtones — a much higher number than the Rugby's ten. Plus the voice calling feature works flawlessly and what's more, when dialing a number, you get audio feedback of the number you're dialing. It is like someone is reading aloud what you're dialing — fantastic! Messaging is handled via SMS, MMS, email and IM. Though IMs are charged as separate texts, so this is not a texting phone, unless you have a very good data plan. Only POP3 protocols are supported for emails, no IMAP here people. Please continue to page 2, for more in our Samsung Convoy Vs. Rugby battle, including who we crown the overall winner. 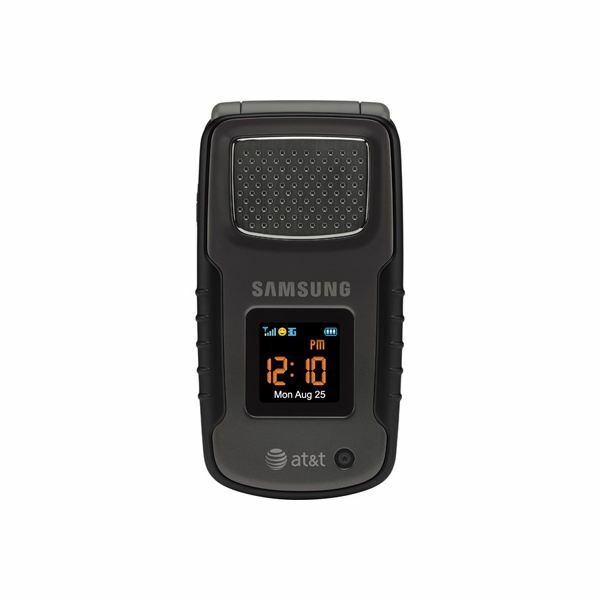 Samsung Rugby: The Rugby is a GSM phone, unlike the Convoy which is a CDMA phone, so for international roaming the Rugby is the better option. The Rugby supports the following range of frequencies — 850, 900, 1800 and 1900, while 3G is supported via HSDPA 850 and 1900. Local connectivity is supported via Bluetooth 2.0 with AD2P and microUSB 2.0. You can use an 8 GB card problem free, the internal memory is limited to 130 MB. The phone's camera shoots very good pictures considering it's just a 1.3 MP effort. Pictures generally turn out clear and bright but there is a bit of over-exposure on bright colors. As a result, some colors look stronger than they are, while textured surfaces are rendered out a bit too smooth and bland, but there is nothing overly disappointing . You also have access to a good number of options — a self-timer, brightness, white-balance, mosaic shot, panorama view, multi-shot and night modes. 4x digital zoom is present, though it is useless at the highest resolution (1,280 x 960). Multimedia is not the point of this phone. It will play your music files as long as they are encoded in the MP3, WAV and AAC+ formats. Video formats are restricted to the MP4 and 3GP formats. Videos will play at a maximum resolution of 320 x 240, which is thankfully higher than the phone's native resolution. The Rugby is also chock full of AT&T apps, as it comes with– My Cast 5 Weather, Mobile banking, Yellowpages, MobiTV and other services. The phone does also come with a voice recorder, organizer, voice memo, predictive text input, alarm, calculator, calendar, JAVA and GPS. Samsung Convoy: The Convoy is a CDMA region phone running on the 800 and 1900 frequencies for calling, while high speed connectivity and PTT calls are handled via EVDO rev.A, local connectivity is handled via Bluetooth 2.1 with AD2P, and USB 2.0, internal memory is capped at 90 MB, which is smaller than the Rugby's. External memory capacity is the same as the Rugby's at 8 GB, though there have been reports of a 16 GB card running smoothly; I was not able to verify these reports, but an 8 GB card does work problem free. The 2 MP camera shoots on a par with the Rugby's 1.3 MP snapper, pictures turn out the same, with the only difference being a barely perceptible purple/pink hue in the background, so overall, despite the higher resolution, you basically end up with the same picture quality with either phone, but you do get a much more capable zoom function at 10x. Videos taken from the camcorder are only worth viewing on the phone, and even that's being generous. The Convoy, unlike the Rugby, is designed to be music friendly, with direct controls on the external screen and an option to play, shuffle, create play lists, and select songs by artist, genre and album. Sound quality is good enough, nothing stellar, and it manages to maintain sound integrity even at the higher echelons of volume. Supported music files are MP3, AAC, AAC+ and WMA (no WMA on the Rugby), video playback is supported on MP4 and 3GP files only, but the playback quality leaves a lot to be desired. This gadget is more oriented towards music than anything else. Features wise, the Convoy comes with a lot of Verizon apps, but some of them don't feel like bloatware — there's actually some pretty useful stuff. You get– Vcast for video streaming, VZnavigator to use the GPS with and finally Vcast Music with Rhapsody if you want to stream music. Non Verizon features include–JAVA, GPS, a calculator, calendar, speakerphone, an alarm clock, a stop watch, world clock, notepad, tip calculator and finally a currency converter. We're about to see if these phones can hold up their heads proudly as we review their call quality, web browsing and battery life capabilities. Samsung Rugby: Call quality on the Rugby is generally very good. The only complaint is the slight presence of white noise, and occasional background noises managed to sneak through, making callers sound a bit muted. However, turning on the loudspeaker opens the door to a whole different experience, voices not only sound clear and crisp, they are very, very loud. Voices also do not distort or waver on the highest volume setting — this phone is designed primarily as a loudspeaker phone. The signal does drop in very remote areas, but this mostly affects the 2G network and not the PTT functionality. However, if you end up dropping below three 3G bars, the PTT functionality goes down the drain. Browsing the web is an averagely good experience, considering the Rugby's low end pedigree. The WAP browser manages to load pages in about 30 seconds on a 3G connection. Pictures, unfortunately, tend to be rendered badly and slowly, zooming is a pain in the neck and there is no text re-flow, it's recommended that you download and use Opera Mini instead. Battery life lasts for about an average of two days on absolutely minimal use, talking time is about 5 hours and 30 minutes on 3G and 7 hours on 2G. The Li-Ion 1000 mAh battery is not a real slugger. Samsung Convoy: Call quality on the Samsung Convoy is slightly better than on the Rugby, as background noises rarely interfere and there is no white noise at all. Callers sound natural and clear. My only gripe with the loudspeaker, while still on the loud side and still very clear, it that it is not as loud as the Rugby's. Unlike the Rugby, PTT calls on the Convoy cost $5 a month on subscription, whereas on the Rugby PTT calling is a natural part of the phone. The web browser is cleaner, more efficient and renders better images, but is very slow. I'm almost tempted to call the 3G connectivity a lie — it can easily take upwards of 2 minutes to download a 4 MB file, whether song or movie clip, it doesn't matter. Although you'll be better off with Opera Mini installed, it won't go any faster, so there is no real point. The battery life fares slightly better than the Rugby's, which is a disappointment as a Li-Ion 1300 mAh battery should have at least outpaced the Rugby's by a mile or so, but it doesn't. It has the same talk time and stand by times as the Rugby, the only advantage is that it can last for two days on heavy use, so it's the longer lasting and slightly better sounding phone, but the Rugby is the louder and clearer phone on loudspeaker, and has a faster 3G connection, but a worse browser. So we have arrived at the end of our journey, the Samsung Rugby and Samsung Convoy have been slugging it out for the past four sections, and the Convoy has won every round except for the last one, which ended in a draw between the two. So this suggests that the Convoy is the superior phone, and to some extent this is true, but the Samsung Convoy is not really a rugged phone; it is at best a doppelganger. The phone cannot withstand being frozen, water enters through the ports even when tightly sealed, it is not dust proof and sub zero temperatures will kill it. It's not as sturdy either, running it over with a car just once will kill it completely. The Rugby can withstand far more pressure and is resistant to water, fog, dust, ice and can be run over nearly six times before it gives out. So if you want a truly rugged phone with proper PTT functionality, the Rugby is a far better option, if you want a typical user phone that's a bit on the sturdy side, then you can opt for the Convoy. The choice is yours.